Sacroiliac joint involvement is not specific to seronegative spondyloarthropathies (SpA). There are some rare reports of conditions which mimic sacroiliitis. This paper reports a case of follicular thyroid carcinoma in a patient who had been referred to a rheumatology clinic with hip pain. Sacroiliac joint involvement was her presenting feature before she was correctly diagnosed. The patient was a female, 63 years of age, who referred to a rheumatologist because of unilateral hip pain. Patrick's test on her right side was positive, and the range of motion of her right hip was restricted. Imaging studies included conventional hip radiography and magnetic resonance imaging (MRI) revealed sacroiliitis with surrounding destructive lesion. In review of systems and physical examination, a thyroid nodule was found. Computed tomography (CT)-guided needle biopsy of her hip and fine needle aspiration (FNA) of the thyroid nodule established follicular thyroid carcinoma. In approach to sacroiliitis, rare differential diagnoses (besides SpA) and mimickers of sacroiliitis such as neoplastic lesions should also be considered to avoid misdiagnosis. 1. Slobodin G, Boulman N, Rimar D, Kaly L, Rozenbaum M, Rosner I, et al. Acute sacroiliitis. Clin Rheumatol 2016; 35(4): 851-6. doi: 10.1007/s10067-016-3200-6. 2. Gómez Rodríguez N, Peteiro Cancelo A, Ibáñez Ruán J, González Pérez M. Epithelioid sarcoma of the right ilium mimicking sacroiliitis. Reumatol Clin 2013; 9(2): 120-2. doi: 10.1016/j.reuma.2012.03.008. 3. Binicier O, Sari I, Sen G, Onen F, Akkoc N, Manisali M, et al. Axial sarcoidosis mimicking radiographic sacroiliitis. Rheumatol Int 2009; 29(3): 343-5. doi: 10.1007/s00296-008-0677-6. 4. Duman I, Aydemir K, Tan AK, Dinçer K, Kalyon TA. An unusual case of osteoid osteoma clinically mimicking sacroiliitis. 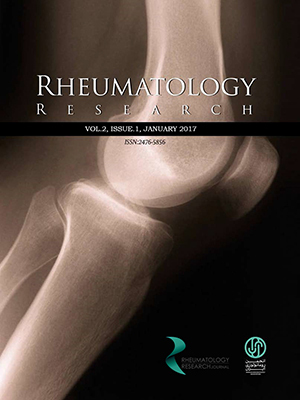 Clin Rheumatol 2007; 26(7): 1158-60. doi: 10.1007/s10067-006-0280-8. 5. Maillefert JF, Mischis-Troussard C, Proy A, Piroth C, Tavernier C. Pyomyositis of the psoas and the iliacus muscles mimicking infective sacroiliitis. J Clin Rheumatol 1996; 2(4):231. doi: 10.1097/00124743-199608000-00013. 6. Humphrey SM, Inman RD. Metastatic adenocarcinoma mimicking unilateral sacroiliitis. J Rheumatol1995; 22(5): 970-2. 7. Olivieri I, Gemignani G, Camerini E, Semeria R, Christou C, Giustarini S, et al. Differential diagnosis between osteitis condensans ilii and sacroiliitis. J Rheumatol 1990; 17(11): 1504-12. 8. Solmaz D, Onen F, Balci A, Akar S. Pelvic Ewing sarcoma mimicking sacroiliitis. Arthritis Rheum 2013; 65(1): 290. doi: 10.1002/art.37710. 9. Garip Y, Dedeoglu M, Bodur H. Osteomalacia mimicking spondyloarthropathy: a case report. Osteoporos Int 2014; 25(7): 1983-5. doi: 10.1007/s00198-014-2716-3. 10. Modaressi K, Fuchs B, Sutter R, Bode P, Meili S, Weber U. Clinical images: osteoblastoma of the ilium mimicking sacroiliitis. Arthritis Rheum 2013; 65(6): 1674. doi: 10.1002/art.37915. 11. Tezcan ME, Temizkan S, Ozal ST, Gul D, Aydin K, Ozderya A, et al. Evaluation of acute and chronic MRI features of sacroiliitis in asymptomatic primary hyperparathyroid patients. Clin Rheumatol 2016; 35(11): 2777-82. doi: 10.1007/s10067-016-3172-6. 12. Wu K, Hou SM, Huang TS, Yang RS. Thyroid carcinoma with bone metastases: a prognostic factor study. Clin Med Oncol 2008; 2: 129-34.